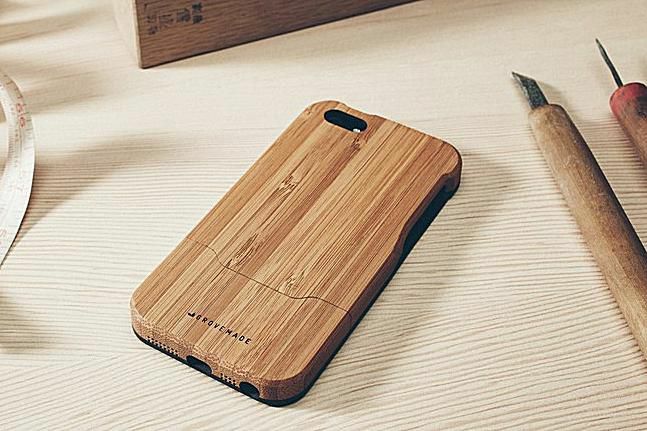 The Grovemade bamboo and wooden case adds touch of nature to the iPhone’s modern design. With every passing decade, technology continues to grow by leaps and bounds. The touchscreen smartphone popularized by the iPhone is a perfect example, quickly leaping from an idea mocked by Microsoft’s Steve Ballmer to a form factor now considered indispensable by countless consumers. Just ask former smartphone leader Blackberry. Despite their vibrant displays, however, there’s still something distantly cold about devices such as Apple’s iPhone or Samsung’s Galaxy line. For iPhone users, Portland-based Grovemade tries to rectify the situation by literally laying the wood — or bamboo — on a line of cases for the popular device. Sanded by hand by, well, an actual person, the Grovemade iPhone case has a human touch that adds some warmth to the gadget’s industrial design. Like the uniquely designed Loop Mummy, this case is definitely a conversation starter, especially among folks who are used to the predominantly plastic cases that dominate the market today such as the Seidio Obex or Hitcase Pro. It also looks quite nice and surprisingly goes well with the more modern look of the device it cradles. For folks who like variety, the Grovemade iPhone case also comes in several options besides the bamboo version featured in this review. These include a darker walnut version and a lighter maple-based trim. There is also a multi-color option that uses recycled skateboard material if you prefer a more psychedelic vibe. Speaking of recycled, use of natural materials is a big emphasis for the Grovemade case. In addition to the case itself being primarily made of bamboo or wood, the packaging itself uses a mix of corrugated cardboard and paper stock, which is a nice touch for environmentally conscious folks. Installing the case is pretty simple. Grovemade designed the case in two parts and getting the phone in place is as easy as sliding it in. Taking out the phone is just as straightforward, especially when compared to the nail-breaking exercise that some cases can put you through. When installed, the case provides the requisite openings for the various buttons, headphone jack and charging port. Note that the recessed openings can be chunky so it can prevent users from docking the phone or using headphones with thicker plugs. The case adds a bit of chunk to the phone as well, though the black lip in the version I sampled helps provide an illusion of thinness. Despite the fact that I quite like the look and general idea behind the Grovemade case, it also comes with it share of issues. One is that the outer lip that protects the screen from contact isn’t raised as high as some other cases. Although this provides a much cleaner overall look when paired with the iPhone, it also grants less protection from drops on uneven surfaces. When sliding, you’ll also want to make sure the case catches the side railing of the phone properly or the fit won’t be as secure. Otherwise, it can potentially cause the case to separate after a drop, especially from an impact on its corners. Also, while the fit is snug during initial use, it can loosen over time, especially if the inner backing starts to wear off. Lastly, pricing can be pretty high for a case. The iPhone 4 variants, for example, cost $59 while the iPhone 5 versions were $79 when those came out. The larger cases for the latest iPhones cost even more at $99 for the iPhone 6 and 6s and a whopping $109 for the iPhone 6 Plus and 6s Plus. A case for the iPhone SE, meanwhile, will set you back $89. It’s just one of the realities with a case that’s worked on by hand and not mass produced by a machine. Overall, however, the Grovemade iPhone case works well for the slice of the population that it targets. It certainly isn’t for consumers who value either affordability or complete drop protection. For environmentally conscious folks or those who place a premium on a unique look, however, the Grovemade iPhone case brings the wood, so to speak. And if that last line made you chuckle, well, more power to you, my friend.